Canvas does not have built in functionality to replace or update an uploaded SCORM module. This document outlines a work-around. Warning: This work-around has not been extensively tested or supported - you should do testing on your own as well. Save or publish your SCORM package from your tool of choice using a naming scheme which indicates that it is newer - for example "Captivate Module v2"
Upload the new SCORM module by logging into your Canvas course, selecting the SCORM tool and clicking the Upload button. Click Choose import type... drop-down menu and select import as graded assignment. Click Go to create a graded assignment associated with the new SCORM module. Click the Canvas Assignments tool. Click on the name for new SCORM module assignment. It should currently not be published. Scroll down to Submission Type. Copy the external URL which is under the text Enter or find an External Tool URL. Click the Canvas Assignments tool again. Click on the name for the old SCORM module assignment you want to update. Scroll down to Submission Type. Highlight all the text under Enter or find an External Tool URL. Delete the text. Click Save on the bottom right of the screen. This will keep the original assignment and thus gradebook entry so you don’t lose grades for students who already completed the assignment. 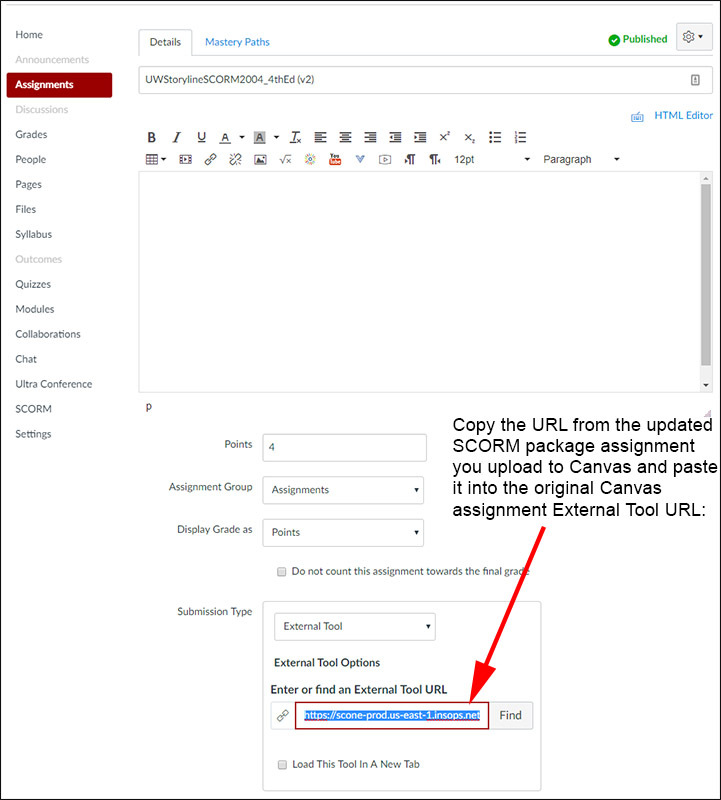 Make sure that the new Canvas assignment that was created when you uploaded the new SCORM object is not published so students don’t see it and get confused. Another option would be to delete the new assignment after you've copied the External Tool URL out of it. Do not delete the old SCORM package out of Canvas as it would delete the assignment – even though you’ve linked it to the new SCORM module. Anything beyond a simple text edit on a slide could potentially cause issues with students who had partially taken the SCORM module due to resume data. This work-around has not been extensively tested or supported - you should do testing on your own as well.